(Canis lupus) Wolves are legendary because of their spine-tingling howl, which they use to communicate. Wolves have a very complex communication system which includes body language and scent marking as well as vocalizations. They use this communication system to send messages to each other, their pack and other packs and animals nearby. What does the timber wolf eat? The timber wolf is a carnivore, but is also opportunistic and will eat what is available. Their preferred prey is large animals such as deer, elk and moose. When they are successful, wolves do not eat in moderation. A single animal can consume 20 pounds of meat at a sitting. Wolves also eat smaller mammals, birds, fish, lizards, snakes, and fruit. 6 to 8 years in the wild, up to 18 in captivity. How many timber wolves can be born at a time? Up to 12 pups. There were 9 pups born at the zoo in 2009. The Timber Wolf lives in Canada, Alaska, Pacific Northwest, north Midwest, and northern Europe and Russia. They live in cold prairies, forests, and mountains. Once they were found throughout much of the contiguous United States, but they were hunted to extinction throughout most of their native range in the early 1900s. The average male wolf weighs about 145 lbs. Wolves are legendary because of their spine-tingling howl, which they use to communicate. Wolves have a very complex communication system which includes body language and scent marking as well as vocalizations. They use this communication system to send messages to each other, their pack and other packs and animals nearby. Though they almost never attack humans, wolves are mistakenly considered to be one of the animal world’s most fearsome natural villains. They are known to roam large distances, often between 30 to 50 miles in a single day; however far is necessary to find food. They can run at about 40 to 45 miles per hour. Wolf packs are established according to a strict hierarchy, with a dominant male as the Alpha. His chosen mate would become the dominant female. Usually this male and female are the only animals of the pack to breed. Wolves are highly intelligent and social animals and they hunt cooperatively. Wolves have extremely powerful jaws, about 1500 pounds per square inch of power. The facility had a breeding permit for the wolves for many years. Every year, our one female wolf Wakiza (who passed in 2014) went through a false pregnancy but in 2009, when we checked her during what we assumed was another false pregnancy, we felt movement! 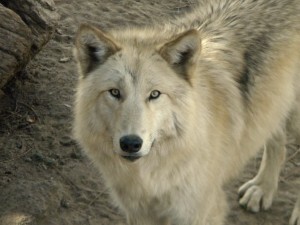 On April 9th, 2009, our 9 year old female Wakiza had 9 wolf pups by cesarean section. It was just too hard for her to deliver them naturally at her age. She was really out of it for two days, and wolves have to bond with their offspring within the first 24 hours or they do not recognize them as their pups. Zoo staff had to hand raise the 9 wolf pups from day one, an extremely exhausting process, but an experience they would not have wanted to miss despite the very long tiring hours. All nine wolf pups survived, and now all of our wolves are fixed. We did have to separate two of the female pups because they were getting too aggressive with the other wolf pups, so they now have their own enclosure. The other seven pups share another enclosure. The pups were born in 2009. Their mother was not able to care for the pups and required assisted care by our staff. They have all been spayed or neutered.